As near can be determined, the church was organized in February 1850 under the name of Macedonia Baptist Church. It was located a few miles southwest of Magnolia in the community of Mink Prairie. According to records of the Union Baptist Association of Houston, the Macedonia Baptist Church made application for membership in that association in 1863 and was accepted. The church had 20 members at that time. The following excerpt is taken from the minutes of the conference meeting in 1886: "The newly constituted church of Mink, organized instead of Macedonia Church (dissolved), presented a petitioning letter, and upon motion was received. On motion the name of Macedonia Church was dropped from the roll." Delegates attending from Mink Church were J. F. Dobbs, L. D. West, R. R. Stokeley. R. R. Stokeley was also corresponding secretary of the Evergreen Association. On March 4, 1889, John L. Turner and wife, Lydia, of Mink, Texas, deeded one acre of land in the Simon Jones Survey to Mink Prairie Baptist Church for $1.00 and other valuable considerations. A. A. Lawson and F. J. Yelverton were the Baptist Deacons mentioned in this deed. Some of the descendants of these two gentlemen are current members of our church. Tom Goodson and wife, Winnie, donated land in the G. W. Lonis Survey May 3, 1909 and that year the old church building at Mink was removed and the material was used to construct the first building at the present location. Kate Goodson Coe is the daughter of Tom Goodson and reached her 100th year April 24, 1995. The name was changed to Magnolia Baptist Church. Minutes verify there was an active building committee in 1909. Members of the committee were: L. M. Sanders, W. H. Lee, and T. J. Goodson. Services were held in the building from October 1909, even through it was not completed and dedicated until 1912. Among those who worked as carpenters on the building were: W. L. King, L. M. Sanders, Tom Goodson, and S. K. Willyerd - all members of the church. Quite a few organizing activities took place in 1910. On April 2, 1910, Mrs. W. H. Lee was selected as organist and Miss Katie Goodson (age 15) was selected as assistant, to play for Church, Sunday School, and Prayer Meeting. On April 30, 1910, "F. Yelverton and J. A. Steger were directed to make a trade with Lester Goodson (brother of Kate Goodson Coe) as sexton for Church, Sunday School, and Prayer Meeting and pay him out of any moneys on hand, either of church funds or Sunday School." Lester Goodson is deceased. Tent revivals were held once, and sometimes twice, each year. They were usually a joint effort between the Baptist Church and the Methodist Church. A tent committee was appointed to take care of setting up the tent, arranging the pews, and closing everything down when the revival was over. Usually a visiting preaching would hold the revival and it didn't matter whether he was "Baptist" or "Methodist." 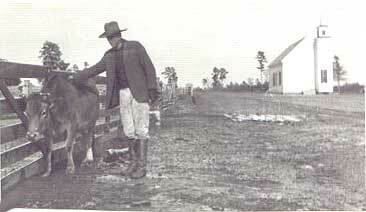 Baptismal services were usually held at the "Mule Lot Hole" or other areas of Mill Creek. The "Mule Lot Hole" was also used as a swimming place for local youngsters. In the 1920's the church struggled to stay alive. The frame building was heated with wood stoves and the flue was constant headache until a new one was built in 1937. Light was supplied by kerosene lamps and the only air conditioning was from open windows and cardboard fans. The fans were usually supplied by local funeral home for advertising purposes! The first choir was organized in 1933 with Mrs. Morris "Bace" Steger as the choir leader. The W. M. U. was also organized that year. By 1937 a half-time pastor was called. For a short time in 1944 there was a full-time pastor, but it was not until 1948 that the church enjoyed the full-time services that continue today. 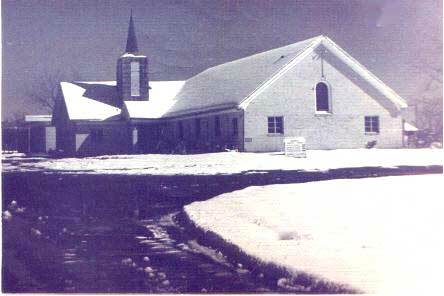 The church voted to build a parsonage in 1944, but it was not until 1966 that one was actually built. However, the Church did provide a place for some of the pastors and their families before the parsonage was complete. 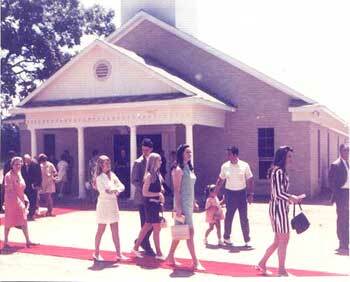 A new brick auditorium was completed in 1950, replacing the building from Mink, at a cost of $11,278.00. In the mid 1950's the front wing of educational building was erected and later on the last wing, which is the Johnson Building. In 1969 the present auditorium was dedicated and the old auditorium made into classrooms and nursery facilities. The Christian Life Center was completed in 1977. 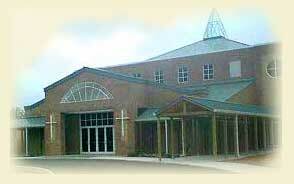 Construction began in July 2000 for a new 10,000 square foot auditorium with a seating capacity of 600. On February 18, 2001 we held our opening day dedication ceremonies with a total worship attendance of over 1100 people attending. The picture below is the entrance to our new facility from the direction of our new entrance on FM1488.